Today we walked around Kabul. First we saw the Pakistan embassy (for a transit visa) then we registered at the US embassy. Marines protect our embassy behind sandbagged barricades and swirls of barbed wire. They politely let us inside where we fill out a form that asks for our names and emergency contacts. 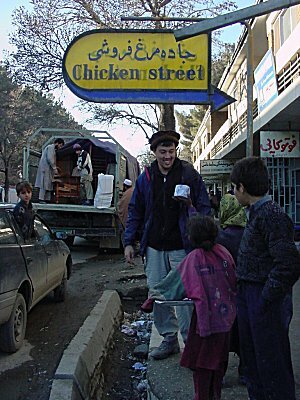 We walk around 'Chicken Street,' the market street of Kabul. Here you can play grenade toss or rocket roulette. That's not a good joke, an Afghan fundamentalist lobbed a grenade at two marines on this street last month. We feel safe, however, because we're dressed like locals and an armed mujadeen (Afghan freedom fighter turned police force) stands on every corner. Snow falls towards evening yet we keep exploring the city because we know the lovely smell of human excrement awaits at our hotel room. We plan to upgrade to a better hotel tomorrow. 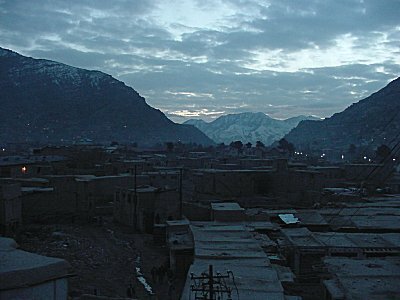 Kabul looks like a city of boxes. 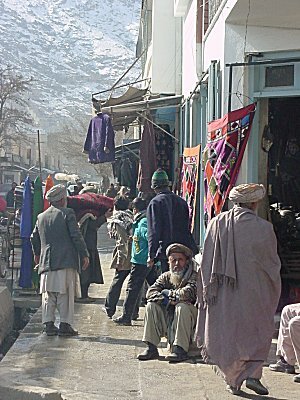 Chicken street is the tourist shopping district of Kabul. Do they think tourists are chickens?